Kind of odd that for a "Wayback" post I would talk about an upcoming car show... But the show happens around the first Saturday in May each year... and so THIS Saturday is the day. 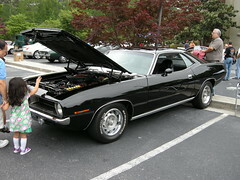 Smokerise Baptist Church is having their 11th Annual Smokerise Car Show on Saturday from 9am until 3pm. Registration runs from 9am until Noon... so there might be a few cars that don't show up until late. Judging runs from Noon until 3pm. And check out this link for pictures from last year's show. There were some pretty cool rides on hand... and that was with showers threatening all day.